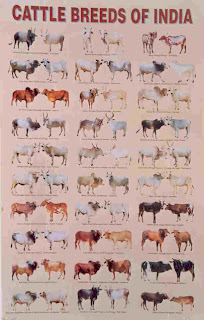 The Kangayam cattle conform largely to the Southern Indian Mysore type, thought there is evidence of the blood of the gray-white Ongole cattle in their composition. Possibly this mixture has given the breed its larger size in comparison with other cattle of the Mysore type. This breed, in its native area, is also known by other names of Kanganad and Kongu though the name Kangayam is well-known. 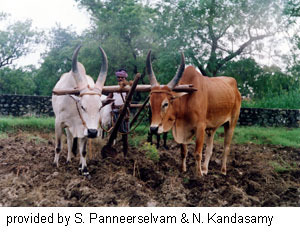 These cattle are bred in the southern and southeastern area of the Coimbatore district of Madras State in India. 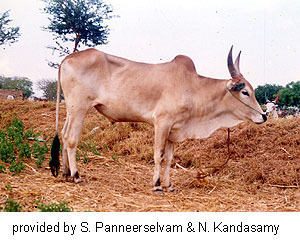 It is observed that there are two varieties of Kangayam cattle, one small and the other large. The smaller variety is found to be more numerous in the Kangayam, Dharampuram, Udmalpet, Pollachi, Paddadam and Erode subdivisions, while the larger variety is found in the areas of Karur, Aravakurchi and Dindigul subdivisions. The breed is found in its pure form in the herds of some large breeders, notably the Pattagar of Palayakottai, who is supposed to have one of the best herds of the breed in the country. Both varieties of this breed are strong and active, with compact bodies and short, stout legs with strong hooves. Horns in the smaller variety spread apart nearly straight, with a slight curve backwards. In the larger variety, the horns are much longer, curve outwards and backwards and almost complete a circle at the point where they approach the tips. The head is of moderate size with only slightly prominent forehead. The head is more proportionate to the body with a straighter profile than in most of the Mysore type cattle. The ears are small, erect and pointed. The eyes are dark and prominent with black rings around them. The neck is short and thick. The back is short, broad and level. The body is compact, with well sprung ribs. The quarters are slightly drooping. The dewlap is thin and extends only up to the sternum. The sheath is well tucked up to the body. The hump in bulls, though well-developed, is firm. The hair is fine and short and the skin is dark in pigment and fine in texture. The tail is of moderate length with a black switch reaching well below the hocks. Kangayam color is usually gray or white. The males generally are gray with black or very dark gray coloring on the head, neck, hump and quarters. In the cows, the prevailing color is white and gray with deep markings on the knees, and just above the fetlocks on all four legs. The calves are light or dark brown with gray or white on the inside of the thighs, ears and forelegs, and occasionally with gray or white rings on the pasterns and fetlocks. At two years the heifer turns gray or dark gray and retains this color but with advancing age after maturity the color fades and becomes white. Male calves become dark gray or iron gray with black shading over the head, neck, hump, dewlap, fore and hind quarters. With maturity the black shading becomes intensified. Castrated males, however, show fading of the color. 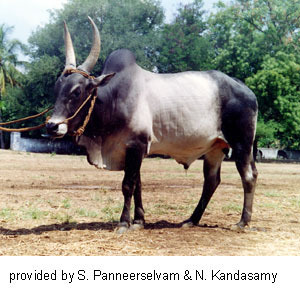 Kangayam cattle are of moderate size, active and powerful, and are highly prized draft animals. The cows are generally poor milkers but there are encounters of fair producing abilities.